Did your mama ever tell you not to play with your food? Mine did. Clearly that didn't go over well! There's nothing better than enjoying some colorful cereal & getting a taste of being a kid again when you're sick & feeling sad. I hope everyone's weekend was great. I have so much e-mail catching up to do, blog catch up etc so bare with me over the next few days. I promise I will be caught up by the end of the week! It is so pretty though! I am sure your mom would understand! Oh no, are you feeling sick and/or sad?? Hope not!! If so, get well soon!! love the pics girl..so colorful! oh my gosh this pictures are too cute! 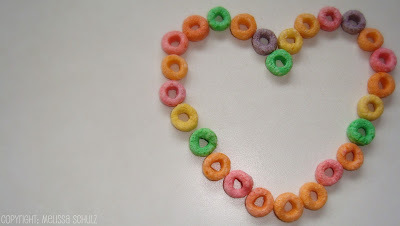 I had fruit loops over the weekend- I forgot how good they were! I can't remember I had that much sugar at once. haha! I haven't had fruit loops in forever. Sweet photos ;-) I like the heart one. You make these look so yummy! i play with my m&m's before eating them.. because they have to be separated into colors before ingesting them... ugh, stupid ocd. Glad your back and hope you feeling better!! You have given me a fruit loop craving!! pretty pictures!! Breakfast of champions!! So glad you're feeling better, Melissa. XO! 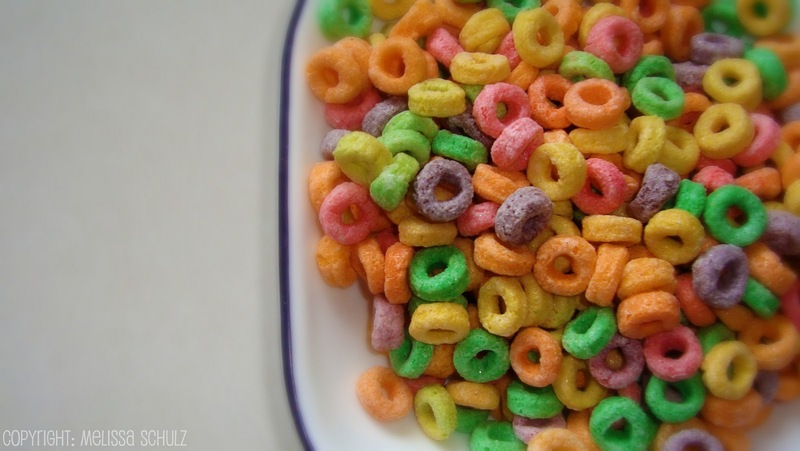 I NEED fruit loops right now! I haven't had those in forever! Glad to see you back my friend! It's supposed to warm up this week....hopefully you'll feel better & the warmth with make you happy....and maybe we'll also get to have our coffee/photo date!!!! Very cute!! Are those cheerios? I never new they had multi-colored cheerios. very cute photo! that heart is so perfectly shaped!! Cute! I love how the color pops. SUCH a cute picture, i love it!! Soooo cute! Love the heart! That came out so cute!!!!!!!!!!! LOVE IT! Um, yeah. Don't think I listened to that lesson all that well, either! hehe! So sorry -- hope you start feeling better soon!!! Being sick is never fun!! And I hope other things start looking up for you, as well! I have to admit I do not like cereal the only kind I eat is oatmeal. But the hubs loves cereal the more sugary the better. Awwww, this is so cute! I love cereal, preferably dry. Weird, I know! heheeh LOVE the heart pic!! soo cute!! This makes me smile, Missy! I seriously love you. Thanks for making this, taking a photo, sharing with everyone because it brightens days!! I eat Fruit Loops every night for a snack. Those are so cute! Haha yay for kids cereal!